GFS Says - Play It Again Sam! This morning's GFS run of the operational model indicates that the first week in March could be quite similar to the last week of February. A S/W at 500 mb passes to the north at midweek, albeit stronger and closer than during the week just ended - perhaps more significant winds and some showers around. But, the really interesting forecast at 500 mb is shown above - valid at midnight next Saturday night (06 UTC Sunday March 7th). This forecast is quite similar to this morning's 500 mb analysis shown two posts earlier today. So, it looks like there's the possiblity of yet another stormy weekend, which would make three out four. For the record, the GFS appears to be 24 to 48 hours faster than the ECMWF by next weekend, so we'll need to keep a close eye on both models during the week ahead. Nice visible satellite image of the clouds over southeastern Arizona this morning. Yes, the models have made quite a bit of progress from the days of the barotropic model. We're both old to recall those days! I suspect we can reasonably expect continued model forecast improvements, including predictions of uncertainty, although the limits to useful predictability may never move much beyond where they now are. The limits imposed by nonlinearity are pretty solid. The cold front associated with the 500 mb shortwave that is now moving across Arizona (see above 12 UTC NAM analysis for February 28, 2010) moved across southeastern Arizona during the early morning hours. 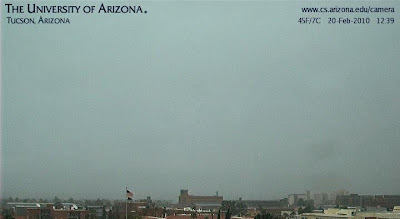 There was a strong frontal band of showers and apparently some embedded thunderstorms (the TUS NWS radar has been down since around midnight, so no radar info for southeastern Arizona is available for this event) - Nogales carried lightning on their obs and Phoenix had several thunderstorms observed. Winds gusted from the west at up to around 40 mph. General rain or snow has occurred across most of the state except for far northern and eastern reaches. The 100% POPs forecast by the NWS has verified nicely and light rain continues here at house. At 6 am we had received 0.35" and amounts around southeastern Arizona were generally arounf 0.20 to 0.50", although some stations in the Catalina foothills had around 0.75". Amounts were also around 0.75" or so in the Phoenix area. 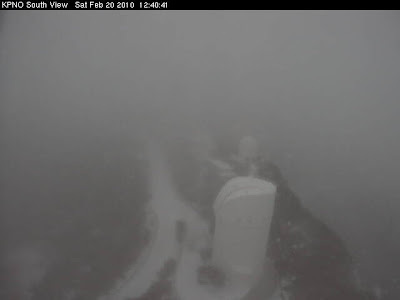 The top image above is from Kitt Peak and shows that winds had blown the rain or snow there onto the camera and it appears to have frozen, producing the artistic result. The Pacific storm mentioned the last several days is currently located south-southwest of SFO. The forecast models continue to dig the 500 mb cutoff far south down the California coast before swinging it inland across southern Arizona tonight and tomorrow. The slush bomb storm that hit the Northeast will finally begin moving off to the east Sunday afternoon and night, letting the Southwest system move on eastward. The NAM forecasts a nice precipitation event with a quarter to more than an inch of water over southeast Arizona, with highest amounts in the mountains. During the last several winters I have been continuously impressed by how accurate the forecast models have become - particularly over the eastern Pacific where offshore jetstreams are now predicted very well. All quite amazing to someone who started forecasting when the operational model was the barotropic and the PE model was an experimental test model! The much advertised precipitation event for this weekend has been pushed back in time a bit by this morning's NAM forecast run. The very complex and persistent 500 mb cutoff in the east (see top graphic) has several vorticity maxima rotating around its western and southern peripheries. These are holding the system in place longer and preventing the rapid movement eastward of the strong S/W and cutoff forecast to be over the Southwest Saturday night and Sunday morning. The NAM is now forecasting a more substantial precipitation event for southern Arizona - see bottom graphic with 24-hour forecasted precipitation for period ending at 5 pm Sunday afternoon - with the bulk of the predicted precipitation occurring during the day Sunday. With clear skies this morning over most of Arizona, the visible satellite image above shows how significant the mountains snow cover is over the northeastern mountains and the southeast sky islands. Yesterday's event only produced 0.07" here at the house but amounts were higher in the mountains and it appears that all of the Pima county ALERT gauges had measurable rainfall or snow except for a couple of sites in the far southwest part of the network. Low here in backyard was 26F this morning and it was very frosty out until sun got up a bit. The Rillito is running nicely today. It appears that the next S/W at 500 mb will zip by to the north of Tucson. There is a very large cloud mass coming ashore over California and it is not clear whether part of this will persist to southeast Arizona. Attention turns next to the northeast US, where the models predict explosive cyclogenesis along the coast on Thursday. The folks in Albany may have their stormiest and snowiest week of the winter. Models continue to bring strong system through the Southwest next weekend. Mike is on the right track. The "jamming" observed on the radars occurs when the military are conducting exercises. I posted this chart because it is the first time I recall seeing a "jamming" echo spike from what seems to have been a single source simultaneously affecting multiple radars. Single "jamming" spikes are of course common, but this seemed to be something different. Or it could be that this is common and I just haven't happened to notice it before. Regardless, I chuckled when I first saw it, since the spikes seemed to point at the infamous area 51! The slightly different in time radar chart above (from a loop I just ran at NCAR RAP) indicates that at least two different aircraft were jamming radars in this area and it was just a chance occurrence that the spikes on first image appeared to be coming from same source at same time. I certainly don't know what the explanation might be for this strange chart - comments most welcome! After a rainy, cool and heavily clouded weekend, the new week begins with the western US S/W at 500 mb phasing and merging with a Pacific vorticity max over southeastern Arizona during next 24-hours. So a showery day on tap. Then by Thursday another broad and diffuse S/W moves across the west coast. This feature consolidates, strengthens and moves southeastward. This S/W's vorticity max passes very close to Tucson by Thursday evening and the evolution of this feature should be watched closely - currently the NAM forecasts its main precipitation impact to be in Arizona's mountains and New Mexico. By next weekend a much stronger wave at 500 mb comes ashore and cuts off over the Southwest (according to the GFS forecast runs from last evening - 00 UTC 22 Feb 2010). The GFS ensemble mean and spaghetti plot for the Northern Hemisphere valid next Sunday Feb 28th at 5 am are shown above. It is quite interesting that the ensemble spread of forecasts and uncertainty is greatest over the Western US; however, all 12 members forecast precipitation over southeastern Arizona for the 12-hours ending at 156-hours. It is also interesting that the operational GFS (white contours on right panel) is an outlier relative to the other members, moving the trough/cutoff eastward faster than the other forecasts. Regardless, more rain on track for Tucson - noticed driving around over the weekend that our winter weeds have begun a period of wild, rapid growth. The same is true for the thousands of potholes lurking out there on Tucson's streets! Yesterday evening another band of rain showers moved into the Tucson greater metro area, adding to the midday rainfall amounts. Here at the house the final total came to 0.38". Amounts for the 24-hours ending at 7 am across eastern Pima County ranged from about 0.20" to around 0.75" with the higher amounts in the foothills below the snow level and in the Redington Pass area. Another system is approaching from the north this afternoon. The GFS ensemble members have all been forecasting precipitation over southeast Arizona with this system since at least 96 hours ago (for the 12 hour period ending at 5 am on Tuesday morning). Interestingly, there is yet another forecast on the weather page of the Star this morning that is out of sync with the forecast that NWS has had out (60 to 80% for tomorrow) for a number of forecast cycles. I assume that someone isn't checking either the NWS forecast nor the GFS ensembles nor..... regardless, weather followers this morning would find 50% chance of rain tomorrow in the newspaper and 80% chance in the current NWS forecast. Hopefully these problems are in the way AccuWeather does it forecasting from back in Pennsylvania! The GFS ensemble members are predicting (almost unanimously) another precipitation event over southeast Arizona next weekend on Saturday night and Sunday (February 27 and 28). Will be interesting to watch to see if subsequent model runs remain consistent with this morning's predictions. Rain event, so far, was characterized by a fast-hitting area of cold rain that swept across the Tucson area from about noon to 2:30 pm. 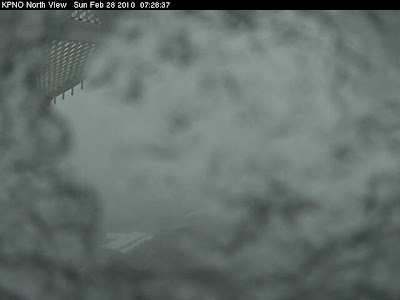 Every ALERT gauge in the Pima County network had measurable rain last six hours, except for the high elevation stations, which had a burst of heavy snow. Thus a 100% coverage event that brought amounts of 2/10 to 5/10 of an inch - 0.24" here in the backyard. Snow level came down fairly low, so that some heavy cover is peaking out from the Catalinas at about 3500 to 4000 ft MSL. 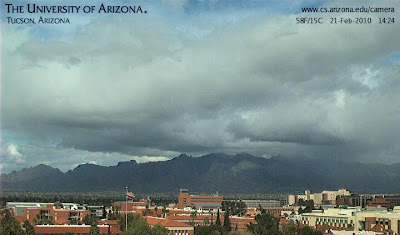 Photos above both from a bit before 1 pm show the rains and clouds obscuring the Catalinas and that it was snowing up on Kitt Peak. And the next act will be? Clouds are increasing rapidly from the west and southwest ahead of the Pacific S/W. Rest of the day should be quite interesting here in Tucson area, as well as much of Arizona. Bottom image above is the nearly current visible satellite imagery showing the distinct line of cloudiness that is advancing across the state - note apparent mesoscal circulation near Blythe, CA. 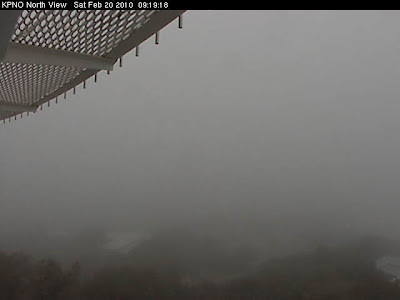 Top photo above shows that Kitt Peak is already in the clouds! After a week or so of beautiful, dry sunny weather here in the Southwest, the large-scale pattern is changing and a week or more of unsettled, winter-like weather lies ahead. There is currently a S/W or cutoff west of southern California. This feature breaks under the large, west-coast ridge at 500 mb and moves quickly eastward across the Borderlands under the larger S/W that is over Idaho this morning. The NAM forecasts widespread precipitation ahead of both S/Ws - see 48-h precipitation forecast at top that ends at 5 pm MST Sunday afternoon. The Idaho S/W at 500 mb digs to the south-southwest behind the first wave and is moving across Arizona on Monday afternoon and night, bringing continued chances of precipitation. The second figure above is the GFS 96 hour forecast - the GFS ensemble members (from 00Z last evening) all forecast precipitation over southeastern Arizona for the 24-hours ending at 5 am next Tuesday. So, the models indicate an unsettled period with the ensembles indicating 100% POPs but light precipitation amounts over low elevations - this stormy period may continue through the coming week. So, more weather to watch. 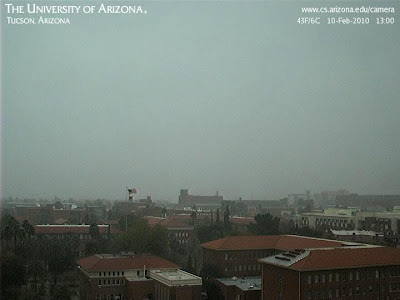 Web Cam view from Computer Sciences yesterday afternoon shows another damp, dreary afternoon on the U of A campus. This event brought 100% coverage of precipitation over all of eastern Pima County, and the RAWS observations seem to indicate that all of southeast Arizona received measurable precipitation. Rainfall amounts at lower elevations around Tucson were mostly in the 2/10 to 5/10s of an inch range. For the first time in weeks both TUS and DMN surface observations indicated thunderstorms were occurring in the metro area - didn't hear any thunder here at house nor observe lightning. Rainfall here in backyard was 0.34". This makes the rainfall total at house for 2010 an amazing 4.37 inches. Skies at sunrise are covered by very low cloud cover and there are possibly a few sprinkles still around. The upper-low has moved off to the southeast of Arizona. The forecast models indicate a building ridge over the west at 500 mb that will persist for around a week, allowing things to dry out a bit. The 13Z water vapor image above has a nice view of the current cutoff just west of San Francisco. This feature is heading south and will eventually move ashore in the far Southwest US near San Diego. The image also shows a very large area of subtropical moisture west of Mexico. This morning's NAM run (Tues 9 February) takes the bulk of this moisture blob across Mexico and into New Mexico and west Texas. But the model forecasts do manage to pull some of this up into southeast Arizona before the event ends. So, an interesting interplay of features to keep and eye on! 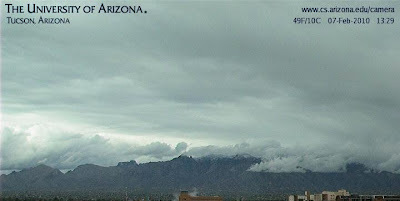 The photo below and this one show shots of the Catalinas and of Kitt Peak early this afternoon as a widespread rain event is winding down in the Tucson area. Some convection is possible as the sun is coming out and trying to heat things up a bit, but the general area of showers and rain has moved south and east. This has been a much better event than that of last Tuesday night and Wednesday morning. Here at the house at 7 am we had gotten 0.37" of rain in the pre-dawn hours, and between then and noon we received another 0.60" of rain. Thus, at this time there has been 0.97" of rain here. At 7 am 41 of the 97 (40%) Pima County ALERT gauges had recorded measurable rainfall and then between 7 am and noon 100% of the gauges recorded rain or snow. So, a nice, widespread precipitation event. At this time the models are forecasting a somewhat similar event to occur across the Borderlands next Wednesday night and Thursday morning. So, the progression of weather systems from the Pacific into the Southwest continues, at least for a few more days, giving us a very interesting el nino winter! Another Rotten Forecast in Sunday Star! For the second Sunday in a row, the Arizona Daily Star weather page has given readers a really bad forecast! We have just had a very nice rain event across Tucson and all of eastern Pima County. I slogged out through moderate rain this mroning to bring in the paper and found that we had a "30% chance of isolated showers and rain today." The NWS had forecast 60% for last night and 70% for today yesterday afternoon - not perfect, but certainly much better than what the paper had. I suspect that the entire weather page and forecast is being supplied by AccuWeather (which obviously had much more important weather events to focus on yesterday!). If this assumption is correct, the big mystery is why KVOA Channel 4 wants their logo and meteorologists' smiling faces bannered alongside AccuWeather's rotten forecasts? The latest weather event has moved eastward and turned into quite a rain-maker for the lower Mississippi Valley. See the early morning radar composite above, from the CoD weather page. I got several e-mails about the event here in southeastern Arizona, so here's a summary. things on Tuesday evening - around 6:30 pm - the NWS forecast looked to be right on track. The IR satellite image showed a huge area of cold cloud that seemed to be moving northward right up toward Tucson. The models were in agreement, forecasting rainfall everywhere in the southeast part of state with some nice amounts indicated by the model QPF. But the model(s) obviously didn't get the movement of the disturbance quite right and were just enough off on the eastward component to change us, locally, from a forecasted good event to an observed almost zip. 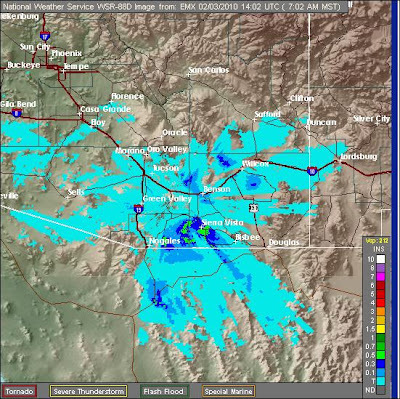 I put the radar precip up on the blog yesterday morning to illustrate what a bust the model forecasts were here, right around Tucson. So it goes! I saw some amounts off to Tucson's southeast over an inch yesterday morning - so it just illustrates how a very small model error can really impact us. The event that's just ended provides a huge contrast to the major event in late December that was forecast very consistently for days and illustrates that sometimes the nodels can lock accurately onto hemispheric forcing and be extremely reliable but at other times be fickle even at 12-hours. As for precipitation yesterday as the system headed east - here at house we got 0.10" and about 65% of the Pima County ALERT gauges had measurable rainfall in last 24 hours. Amounts were mostly around a tenth of an inch or less, with a few spots receving about a quarter of an inch. Arivaca had 0.63", Nogales had 0.44" and Douglas had 0.61" and some RAWS data indicated over an inch amounts in the far southeast part of the state. The more significant part of the event stayed to the south and east of the Tucson Metro NWS forecast zone. And so we have to hope that the next two events coming in off the Pacific do better in getting rain on the ground. The first 12-hours of the significant rain event that the models have been predicting for the Tucson area pretty much fizzled out. The morning storm totals from radar (7 am 3 Feb 2010) shown above indicate little in the way of rain accumulations except down around Sierra Visita. The most significant rains with the subtropical disturbance have stayed in Mexico and also shifted eastward into southern New Mexico and southwest Texas. Here at the house we had some sprinkles after dark last evening but only had a trace in gauge this morning. Only 14 of 97 (about 14%) Pima County ALERT gauges had measurable rain during past 24-hours and amounts were quite light, except for a couple of sites in the Catalina Mountains - Mt. Lemmon 0.39" and White Tail 0.31". This morning's NAM run forecasts some westward shift in the showers during the day today but keeps Tucson right along the northern gradient of the heavier rainfall. The morning TWC sounding indicates only a tiny sliver of mid-level CAPE, so forcing will be mostly orographic and large-scale vertical motion for any rains we do get. We'll have to watch today to see if this much-advertised, model-predicted high POP event actually brings us enough rainfall to wet down the streets.